Now displaying 121 - 140. Then join me, Bill Cook, for a day full of door knocking with real sellers on Saturday, May 9th from 9AM - 4PM. We’ll meet at Jonathan's Restaurant located at 10630 Independence Pointe Pkwy in Matthews, NC at 9AM and spend the day out talking to sellers and constructing win-win deals at their kitchen tables. Where to stand after knocking on a homeowner's door! This isn't classroom theory stuff. It's a 100% real-world experience! Bill and Kim built their real estate investing business square on the back of knocking on sellers' doors. They've been doing this for more than 20 years! Will you learn something new? You bet! Will you see things you've never seen before? Positively! Will you be able to take what you've learned and put it to use the next day? Absolutely! We promise that you'll see things you've never seen before - or will ever see again! We are excited to announce that Bill Cook will be our special guest speaker this month at Charlotte REIA on Thursday, May 7th at 6PM at the Crowne Plaza Charlotte Executive Park located at 5700 Westpark Dr in Charlotte, NC (map). Bill will be teaching us how to talk with sellers and make profitable, written offers on the spot. The #1 reason most would-be real estate investors fail is because of F-E-A-R! The fear of not knowing what to say, and the fear of a seller's reaction to a low offer. What if you could make a safe, full-price offer to every seller? How can you tell if fear is holding YOU back? Here's an easy test: 1) How many sellers have you met with this month? 2) This year? If YOUR numbers are less than YOU think they should be, why are they less? Are you even tracking these two most-important numbers? Do you want to SEE how to do this in action? Do you want to SEE where the best deals are right now? At Charlotte REIA's meeting on May 7th, Bill Cook will explain what he says to a seller, and how he makes a written offer right there on the spot! Get ready for something VERY special… something almost no real estate investing teacher will do. On Saturday, May 9th, Bill will spend the day with a select group of investors in neighborhoods SHOWING YOU how he knocks on homeowners' doors, gets 8 out of 10 sellers to invite him in, and how he makes written offers right there on the spot! Will you learn something new at the May 7th and 9th events? You bet! Will you see things you've never seen before? Positively! Will you be able to take what you've learned and put it to use the next day? Absolutely! Bill & Kim Cook have been investing in real estate for more than twenty years! They've built their business square on the back of knocking on sellers' doors. They have tons of experience at creatively constructing and funding win-win deals. Their investing portfolio is made up of single-family rental homes, mobile homes, a small mobile home park, plus notes and options. To learn more about Bill and Kim, Click Here! Is it crazy to offer $1 million for a $125,000 house - bet the answer will shock you! American IRA - Our mission is to provide the highest level of customer service in the self-directed retirement industry. Use your retirement account to invest in a variety of assets such as real estate, private lending, limited liability companies, precious metals and more. Pantheon Real Estate Solutions - Our mission is to provide comprehensive support for real estate investors and help you find the “solutions” to your real estate investment needs. Our specialized services include private lending, investments and consulting services. Join us and Real Estate Investor Jon Iannotti on Saturday, April 4th at 9AM at the Charlotte REIA Education Center located at 8520 Cliff Cameron Dr, Suite 108 in Charlotte, NC to learn how CATS can teach you to structure profitable transactions with every lead that comes across your desk, especially the ones that most other investors would immediately toss aside. During this full day workshop, Jon Iannotti will expand on the concepts he was only briefly able to talk about on Thursday night at Charlotte REIA. Set your business on "Auto Pilot"
Whether your seller says "Yes" to terms or "No" to terms, you will be able to structure the deal to where you will be able to make money and your seller will be happy too. Jon and Stephanie Iannotti have taken the real estate market by storm. Through the ever-changing ups and downs, they have modified their techniques to meet the needs of the market and have continued to thrive and prosper. Jon and Stephanie have a passion for teaching and helping others get out of the rat race and achieve financial independence. By implementing their CATS (Complete Agreeable Terms System), you will be able to achieve your goals for financial freedom much, much quicker. Don't miss the opportunity to learn how to convert just about any lead into a profitable real estate transaction that you can continue to do over and over and over again! PLEASE NOTE: Charlotte REIA Members can bring a qualified guest such as a spouse, adult child, parent or corporate partner at no extra charge. Non-Members who Join Charlotte REIA between March 30th and April 3rd can attend this full day workshop at no charge. Charlotte REIA Members who renew their membership for one additional year between between March 30th and April 3rd can also attend this workshop at no charge. When joining or renewing your Charlotte REIA Membership, be sure to let us know you want to attend this workshop at no charge. We are excited to announce that Jon Iannotti will be our special guest trainer this month at Charlotte REIA on Thursday, April 2nd at 6PM at the Crowne Plaza Charlotte Executive Park located at 5700 Westpark Dr in Charlotte, NC (map). Jon will be teaching us about how his CATS can help YOU do more deals by giving you the tools needed to structure profitable transactions that others would normally pass on. CATS?!?!... No, we are not referring to his kitty cats… Jon and his wife Stephanie have created a real estate system they call CATS (Complete Agreeable Terms System). The CATS system is currently helping ordinary, everyday investors become extraordinary investors by giving them the tools they need to do deals that 99% of other investors don’t even realize are deals. Deals that are upside down. Deals where the seller wants full price and all cash. Deals where the seller is behind on payments. All types of deals you might normally throw in the trash. During his 90 minute presentation, Jon will teach you how to…. Put your entire business on "Cruise Control"
Jon and his wife Stephanie have over 30 years combined Real Estate investing and teaching experience. They have over 2000 creative deals under their belt and are considered one of the best in the industry. Jon and Stephanie created ACTS (Agreeable Contract Terms System) for when the seller says "Yes" to terms. They created REACT (Reverse Engineered Agreeable Contract Terms) when the seller says "No" to terms and wants full retail value and all cash. They have now combined these two systems into CATS (the Complete Agreeable Terms System) to have best of both worlds. Now they can make offers that have a high likelihood of being accepted on any of the leads that come across their desk and you can too! Come spend 90 minutes with Jon at the Charlotte REIA Meeting on April 2nd where he will explain how to turn seemingly dead property leads into profitable deals. You certainly will not want to miss out on this career changing information! We look forward to seeing you at the meeting! Join Real Estate Investor and Tax Sale Expert Tom DiAgostino at the Elite Tax Sale Training Workshop on Saturday, March 14th at the Charlotte REIA Education center located at 8520 Cliff Cameron Dr, Suite 108 in Charlotte, NC where he will teach you how to create generational wealth for you and your family with Tax Liens & Deeds so you can get out of the rat race forever! PLEASE NOTE: Charlotte REIA Members can bring a qualified guest such as a spouse, adult child, parent or corporate partner at no extra charge. Non-Members who Join Charlotte REIA between March 1st and 5th can attend this full day workshop at no charge. Charlotte REIA Members who renew their membership for one additional year between between March 1st and 5th can also attend this workshop at no charge. When joining or renewing your Charlotte REIA Membership, be sure to let us know you want to attend this workshop at no charge. "I've been around the block for 21+ years and have seen and done it all. This investment strategy is not the flavor of the week. This training will change your financial life forever if you implement the strategies I will teach you. Stop trying to ride the next wave, only to find you're on the back end, left high and dry. At Fortris, we're not just trainers, we're your investment partners. Trust us and come spend Saturday, March 14th, 2015 with us, where I'll explain why this is the best deal source on the planet for every type of investor and show you how to do it each step of the way. I hope to see you at the event!" All of us at Charlotte REIA want to thank you so much for being a part of our organization this year and want to wish you and yours a very Merry Christmas and a Very Happy, Healthy and Wealthy New Year! We look forward to another great year in 2015... More deals, more networking opportunities, more affordable training workshops & boot camps and much more fun! We’ll see you on next year! Thanks again and God Bless! Learn How to Quick Turn Houses That Need Renovations into Fast Cash in Today’s Fast Paced Market! Robyn is the nation’s leading expert on buying properties from motivated sellers at deep discounts, renovating them at lightning speed and selling them quickly for huge chunks of cash. Robyn has rehabbed over 355 properties in her 16 years of investing. Robyn has shared her knowledge with thousands of real estate investors around the country and now she is coming to Charlotte REIA on Saturday, November 15th at 9AM (check in starts at 8:30 AM, class at 9:00 AM) at the Fairfield Inn & Suites Charlotte Uptown located at 201 S McDowell St in Charlotte, NC to teach her cutting edge strategies that will produce huge profits in today’s competitive market. How to Build a Big Fat Cash Buyers List that will be your own ATM Machine. How to Locate, Prescreen & Coordinate Contractors so Your Rehabs Always Finish on Time, on Budget and Are the Highest Quality Properties For Sale. SPECIAL BONUS: Robyn also has a very special bonus for everyone who attends the Rehab Workshop on November 15th. She will be giving everyone a $199 Package of Bonuses that include many of her new CDs as well as Marketing Materials that you will be able to use for the rest of your investing career. Robyn started 15 years ago with no job and $500. She now runs 5 high profit businesses that have produced millions of dollars in assets. At the workshop, she will share all of her business techniques on how to run a business like a business not a hobby so we can all make more money and work less hours. We look forward to seeing you at this great event on Saturday, November 15th at 9AM (check in starts at 8:30 AM, class at 9:00 AM) at the Fairfield Inn & Suites Charlotte Uptown located at 201 S McDowell St in Charlotte, NC. If you are a Charlotte REIA Silver or Gold Member you can follow the instructions in the ReadMe.txt file on how to activate the Silver Edition ($99 value) or Gold Edition ($995 value) at NO CHARGE if applicable! Be sure to join Duncan at the Charlotte REIA Workshop on Oct 4th to learn how to use this AMAZING SOFTWARE. Join Duncan Wierman on Saturday, October 4th from 9AM to 4PM at the Charlotte REIA Education Center at Keller Williams, 8520 Cliff Cameron Dr, Suite 108 in Charlotte, NC for a live 6-hour Internet Marketing Workshop and Strategy Session entitled "How to Beat the Competition, Increase ROI & Do More Deals Using the Power of the Internet" to find out how you can easily leverage the power of the Internet to grow your business quicker and more profitably than you ever thought possible. How to determine if social media sites such as Facebook and Twitter are an effective channel to market your business, and the 3 key strategies you'll need to be successful. WARNING! This Saturday training is currently limited to 50 participants to make sure Duncan is able fulfill his promise to deliver 3 growth strategies to everyone in the room. Therefore we are limiting the class size to ensure personal attention. If you wish to attend, Reserve Your Seat(s) Now! Charlotte REIA Members can attend for $34.95 and Non-Members for $69.95. Charlotte REIA Members can bring a spouse, adult child or parent at no extra charge! Non-Members who join Charlotte REIA from September 24th through October 2nd, 2014 can attend this full day seminar for FREE and bring a qualified guest. 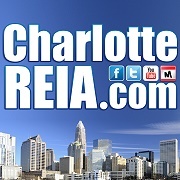 Charlotte REIA Members who renew their membership for an additional year between Sept 24th through October 2nd, 2014 can attend for FREE as well. When joining or renewing your membership, please be sure to let us know you want to attend this event at no charge. Right now is the best time in modern history to buy real estate. Join Larry Harbolt on Saturday, June 7, 2014 from 9:00 AM to 4:00 PM (registration starts at 8:30 AM) at the Hampton Inn Charlotte University Place located at 8419 N Tryon St in Charlotte, NC, and he will share with you his secrets on how to make money in today’s real estate market. Larry will show you what you really need to know to buy real estate profitably with only $10 down, even if you have bad credit or are bankrupt! Buy real estate profitably in any market or economic cycle. Learn how to buy real estate when you have No money. Buy real estate when you have No good credit. Learn how to create the terms to make cash today. Learn how to overcome seller objections like a pro. Learn the right questions that will create Golden Deals. How to create extra profit out of thin air on most of your deals. Never have to beg for or apply for a loan again. How to buy and sell all the property you want and never use a bank. How to structure offers with no payments or interest and get the seller to gladly accept. This will drive your cash flow through the roof. Why you can buy millions of dollars in real estate and never have a debt show on your credit report or be personally liable for a penny. Build your income stream, like the banks have, acquire free assets, without investing a dime. How to change the terms of the loan months or years after the closing and make the seller ecstatic to do so. Build an empire from monthly cash flow and cure negative cash flow – The secret only a handful of people know how to do. Big profits from the “deal after the deal”. All seller-financed deals have back end profit centers if structured properly, and will cost you a fortune not knowing them. How a few carefully chosen words you can easily master in minutes can potentially earn you big paydays when you’re ready to cash out your seller. Come and join Larry on Saturday, June 7th, 2014 for The Ultimate Fast Track to Your Business Success Workshop. Bring a new pad and a couple sharp pencils because Larry promises you will leave with New Methods, Processes and Systems that are Efficient, Effective! And WHEN YOU WILL Learn them, they can be measured by the amount of NEW CASH in YOUR bank account.